In the past twenty years in the United States, we've changed from a relatively hug-free workplace culture to one that, in some quarters, seems to be experiencing a hugging tsunami. Knowing how to deal with hugging is now a valuable skill. 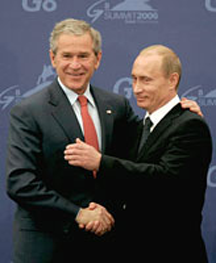 U.S. President George W. Bush and Russian Premier Vladimir Putin in a "sideways hug" at the 2006 St. Petersburg G8 meeting. When hug parters differ substantially in stature, the taller one has an image advantage that can sometimes transform into a political advantage. Photo courtesy U.S. Department of State. Many of us are accustomed to hugging and being hugged by people we love. By contrast, workplace hugging usually takes place between people who respect each other, but who aren't in love. For some, hugging at work therefore presents social and political challenges. We ask ourselves: Should I hug? What kinds of hugs are acceptable? Which people should I hug or not hug? Here are some insights and guidelines for hugging at work. When two people meet, they greet each other, and they sometimes hug or shake hands. It all happens so quickly that we don't realize how we can distinguish the type of greeting that's about to happen. Watch for the forward step. If your partner steps toward you, more than would be necessary for a handshake, prepare for a hug. If there is a standard, a standard workplace hug in the U.S. today is a one-armed reach (usually the right arm) around the shoulders of your partner, including one or two shoulder pats and a smile. Two-armed hugs are generally less common. Even more unusual: two-armed hugs in which the first partner has both arms around the waist of the second, while the second has both arms over the shoulders of the first. The less common a hug style is in your workplace, the greater the risk that some will see it as inappropriate. If you or your partner is wearing anything that might catch on the other's clothing, beware. Few situations are more embarrassing than two huggers who can't disengage, or a hug disengagement that results in a wardrobe malfunction. It's best not to wear anything that can snag the clothing of people you hug. When the heights of a hugging pair differ substantially, the shorter of the two can pay a political price for the hug. People of small stature, especially males, are already at a political disadvantage in many workplaces. Hugging people much taller can exaggerate that disadvantage. Some males prefer not to hug other males under any circumstances. Their numbers are declining, but they certainly have a right to their preference. If you're one of these men, try not to push yourself beyond your level of comfort; if you aren't, try not to push others. Compelling yourself or others to engage in hugging when they'd rather not is at least disrespectful, and it can lead to awkward and embarrassing incidents. For more about workplace hugging, see "Unwelcome Workplace Hugs," Point Lookout for August 8, 2007. Would you like to see your comments posted here? rbrenFcdsciPyojUgrffXner@ChacIglGUOZoVbcBepepoCanyon.comSend me your comments by email, or by Web form. Your boss has popped into your office for another morning gab session. Normally, it's irritating, but today you have a tight deadline, so you're royally ticked. What can you do? Among the vast family of workplace deceptions, those that involve camouflage are both the most common and the most difficult to detect. Here's a look at how passive camouflage can play a role in workplace deception. I offer email and telephone coaching at both corporate and individual rates. Contact Rick for details at rbrenqdSLfyaVOrBRSnqYner@ChacDypnKsqATaFDFKfzoCanyon.com or (650) 787-6475, or toll-free in the continental US at (866) 378-5470.